Posted on November 6, 2010 Author Jaap van der VeldeCategories Hardware, UncategorizedTags castle, playmobilLeave a comment on Too busy! Tonight, at 0:31:30 (23:31:30 PM UTC Feb 13 2009) it will be 1234567890 unit time. 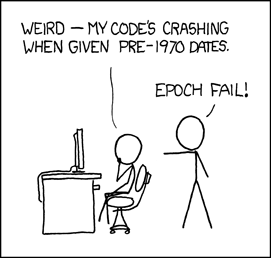 In case you’re not as much of a nerd as I am: unix timestamps are used in many database systems around the world to record date/time combinations. In this system, time is counted as the number of seconds that has passed since the start of 1970. Put on the clock tonight and keep that bottle ready to pop! What is up with widescreens? I’m in the market for a new laptop and have been trying to find something that fits my preferences. It turns out that finding something that really does is going to be very hard because of a single reason: nearly all laptops currently being produced have a widescreen display. What is up with these widescreens? Continue reading What is up with widescreens? Posted on August 8, 2008 Author Jaap van der VeldeCategories Hardware, UncategorizedTags computer, laptop, screen2 Comments on What is up with widescreens?